Jaguar has confirmed it will introduce an exclusive new model to top its XJ luxury sedan range. It made its debut at the 2005 New York Motor Show which is on from 25th March through to 3rd April. The Super V8 Portfolio is the production realisation of the striking 'Concept Eight' show car introduced by Jaguar at last year's New York Motor Show. 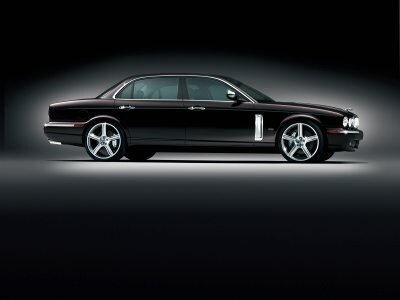 The Concept Eight show car was based on the XJ long wheelbase (LWB) sedan and intrigued show goers with a wood and leather interior, executed with typical Jaguar design flare but with a thoroughly contemporary twist. A number of exterior enhancements also caught the eye to leave the impression that Jaguar could be preparing the way for a new and very special model to head its flagship XJ sedan range. And so it is. 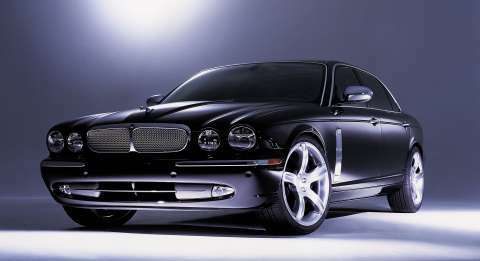 Jaguar is delivering on the promise of the Concept Eight with the 2006 model year Super V8 Portfolio. The Super V8 Portfolio is a sporting long wheelbase sedan with attitude both inside and out. Spectacularly defined by its muscular looks, powerful, modern character and unique interior and equipment features, the 2006 Super V8 Portfolio will take its place at the top of the Jaguar product range and will be built in limited numbers to reach US and Canadian dealers from August this year. "The Super V8 Portfolio takes the Jaguar XJ LWB experience to new heights, reinforcing the contemporary luxury and technology credentials of our flagship sedan while adding even greater exclusivity," commented Joe Greenwell, Chairman and CEO of Jaguar Cars. "It's a car with a real sense of occasion and one that demonstrates perfectly just how capable the XJ is right across the board." The Super V8 Portfolio underlines the quality of Jaguar XJ engineering, with its advanced aluminium monocoque construction which differs from all other production sedans on the market today. It builds on the XJ Long Wheelbase’s lightweight, strong and dynamic performance, exceptional spaciousness and agile, sporty handling. It demonstrates Jaguar’s commitment to intelligent use of technology - to the benefit of driver and passengers, without the confusion of unnecessary complication. It shows, too, that there’s more to the XJ’s core character than space, elegance and luxury, and that Jaguar design is evolving to adopt the best of modern British design. The Super V8 Portfolio will be built as a special edition car, mainly for the US and Canada. Visually the look is distinguished by key design details including the sculpted aluminium power vents in the front wings, the distinctive mesh grille, polished 20-inch alloy wheels, and two stunning new exterior colours - 'Black Cherry' and 'Winter Gold'. Inside, the Super V8 Portfolio is again closely based on the Concept Eight's design cues, featuring a modern interpretation of leather and wood trim, individual power-adjustable rear seats separated by a large centre console, and a new-generation equipment list including Bluetoothâ connectivity, DVD system with twin rear display-screens, four-zone air conditioning, Alpine Dolby Prologic-II surround-sound audio, and much more. The Super V8 Portfolio has the power and refinement of Jaguar’s supercharged 4.2-litre, 32 valve, AJ-V8 engine but for the 2006 model year Jaguar's most powerful engine enjoys a 10bhp increase from 390bhp to 400bhp (SAE). An advanced six-speed ZF automatic transmission takes drive to the rear wheels. Like the XJ LWB on which it is based, it has the longest wheelbase and overall length in the large premium sedan class, but the lightest weight among its rivals. Those dimensions give it front leg and headroom and rear passenger space all comparable with the best in the class. The XJ’s lightweight aluminium monocoque, even in long wheelbase form, contributes to fuel economy, emissions ratings and performance that are virtually identical to those of the standard wheelbase XJ sedans, proving the Super V8 Portfolio’s sporty character is more than cosmetic. The Super V8 Portfolio builds on the XJ Long Wheelbase’s traditional image, and challenges it – with a 21st century attitude that makes the Super V8 Portfolio a different kind of XJ altogether. Bluetooth mobile telephone connectivity, DVD system with twin rear display screens, 400 watt Alpine surround-sound audio system with Dolby Pro-Logic II sound processing, seven amplified channels, and substantially upgraded speaker system – a 2x40 watts increase in output over the Alpine Premium Sound system available on other XJ Jaguars. Laminated side glass for an even quieter cabin, with added security benefit.